Simon Difford shakes things up at Bourbon & Branch. Simon Difford, the man behind the awesome Difford's Guides, was in San Francisco this week. 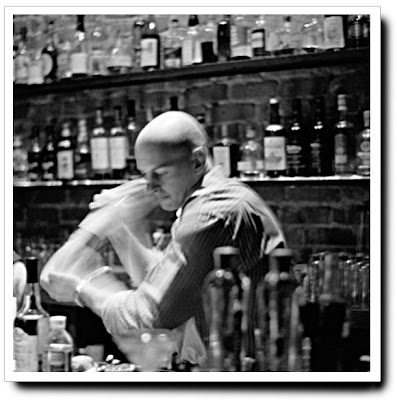 He took time out of his busy schedule to get together with 20 or 30 top bartenders from the local area. We all met at Bourbon & Branch and talked about bartending, Difford's Guides, and the new St Germain Liqueur. St. Germain is an Elderflower Liqueur that Simon has been working on with Robert Cooper. We tasted the liqueur straight, and then Simon shook up a few cocktails. On it's own, St. Germain offers up lovely floral aromas combined with citrus rind and grapefruit. It's not too sweet, and the elderflower is subtle and doesn't smell artificial. The cocktails we tried were mostly twists on classic cocktails. We tried Elderflower Margaritas, Elderflower Sours and Elderflower Sidecars. These were all nice, but why gather a bunch of skilled and creative bartenders and show them these simple modifications. With a liqueur this interesting, my mind was racing with ideas for new creations I could come up with to feature the unique flavors. On the other hand, maybe that was the idea. A very cunning plan Mr. Difford. I can't wait to get my hands on a bottle to work with. Right now, St. Germain is available in California and New York, with wider distribution in the works. garnish with a nice lemon spiral, serve over ice in a highball. This signature cocktail highlights the crisp refreshing character of St. Germain. More St. Germain cocktail recipes here once I get a chance to experiment a little bit.